provide useful insights for businesses that help them understand how their systems are reacting, instantly, such as when you send out an email campaign or engage in marketing that has a temporal nature. It provides alerting / intelligence, giving insight into things that are new or different such as a sudden increase in site traffic. Real-time also lets you win social by capitalizing on trending topics. For example, if you noticed a blog post you published previously is suddenly gaining attention due to something happening in the news, you could highlight it on the front page of your site to draw additional attention and ‘pour fuel’ on the social fire. As with real-time reports, you can easily see your visitors filtered by the device type (by clicking on either of “Desktop” “Tablet” “Mobile”). We’ve heard from users that you like to look at certain segments of visitors in real-time, but dislike setting up the filters each time. 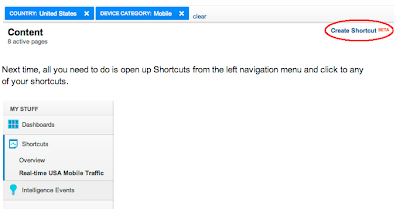 Now, you can use the “Create Shortcut” feature to store your favorite segments. Now all you need to do is open up Shortcuts from the left navigation menu and click to any of your shortcuts. 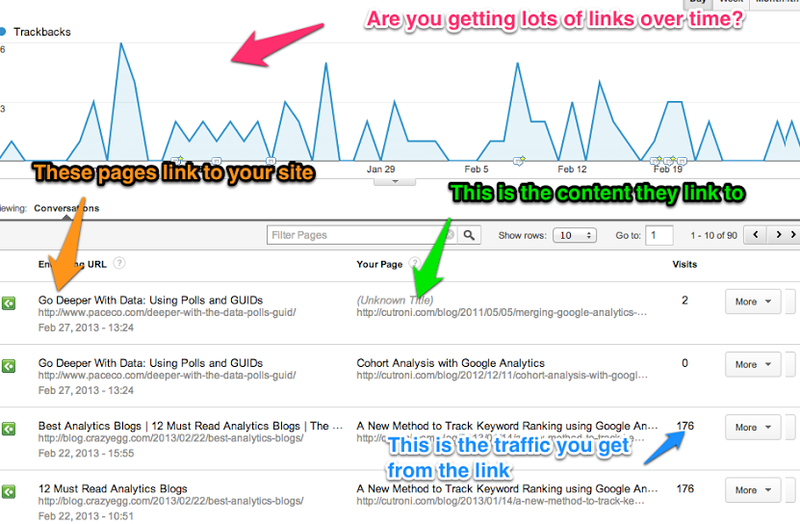 Finally, you can compare the pageviews of your segmented visitors to overall traffic as shown below. 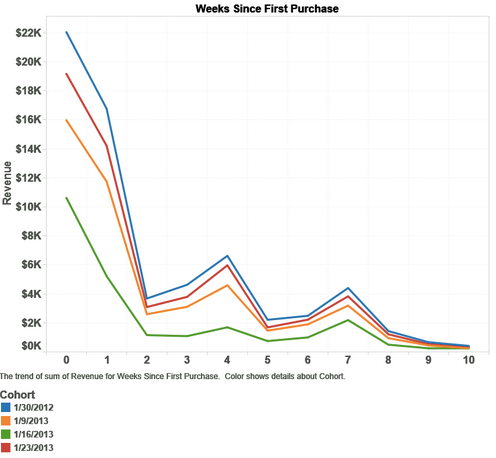 This is nifty if you want to see quick comparison trends. For example, many times, after a G+ post, I create a filter by device type of “Mobile” and can see that the mobile traffic picks up much faster and also contributes more to the initial increase in pageviews. 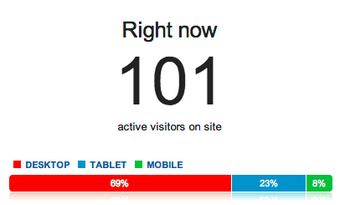 Stay tuned for continued improvements to real-time, a growing area of importance for your digital marketing. The activity stream was previously available via drill down from the Network Referrals or Landing Pages reports. We have now made it a standalone report. By navigating to the Data Hub Activity report you’ll see a timeline of the number of activities that have occurred in the Social Data Hub and the raw activities in a list below. You can also filter this list by any specific networks you choose. We’re also excited to announce that Trackbacks are now available in a standalone report. Trackbacks are all of your inbound links across the web, so you’ll be informed if anyone from a small to blog to the New York Times posts a link to your site. Additionally, we are providing context for the significance of each of these trackbacks by displaying the number of visits that were driven by each endorsing URL during the reporting period. You’ll see this number presented alongside the trackback. Give them a try and happy analyzing! is now available in Japan. Google Analytics Premium offers all the power and ease you expect from the standard version of Google Analytics plus extras that make it great for large businesses. With more processing strength for granular insights, a dedicated services and support team, service guarantees and up to 1 billion hits per month, all for one flat fee. It provides access to more data, flexibility, and 24/7 support to help power the analytics of world-class brands including Travelocity, Gilt, TransUnion, Zillow, Papa Johns, & IGN. For more details check out the full case studies from Gilt and Travelocity. We’re excited to learn how the data driven marketers in Japan will use Google Analytics Premium to find insights that help them to grow their businesses online. We plan to make Premium available to even more countries in 2013. If you would like to learn more about Google Analytics Premium and how it can help your business, contact the Google Analytics sales team or one of our Google Analytics Premium Authorized Resellers. Good news, or 良いニュース as they say in Japanese. 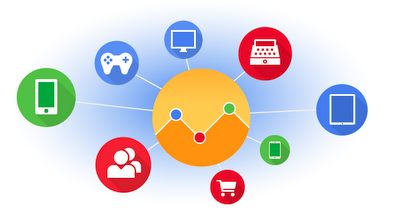 We’re excited to announce that Google Analytics Premium is now available in Japan. Shiraz Asif, Analytics Solutions Architect at E-Nor, a Google Analytics Certified Partner. If you read E-Nor President and Principal consultant Feras Alhlou’s latest post on cohort analysis in a cross-platform environment, and read until the very end, you saw a note about a follow up post on how to automate cohort reporting from Google Analytics in Tableau. This is what I'll outline in today’s post. Why the emphasis on automation, you might ask? Without automation, we end up spending more time than necessary on exporting/copying/pasting/massaging data which can eat up resources better used analyzing and optimizing. In addition to report automation, data visualization is also key. 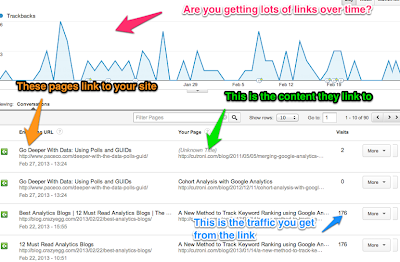 Google Analytics offers amazing visualization, including the recently announced dashboard enhancements, but at times you also want to view the data and trend it or merge with other sources. 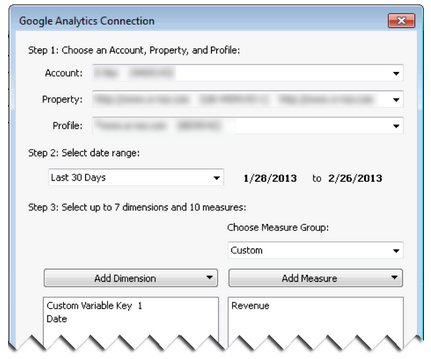 For this, its best to use tools available in the Google Analytics Application Gallery or a BI platform like Tableau. If you have your cohort data elements already captured in Google Analytics, then skip this step, otherwise, this post is on setting up cohort data in by Google’s Analytics Advocate Justin Cutroni is a must. In order to automate reports, you need to have Tableau version 8, since this is the version that has a Google Analytics connector (works well, although still in beta). From the Tableau home screen, select Connect to Data, and then pick the Google Analytics connector. After authenticating to Google Analytics, you'll be prompted to select your Account, Property and Profile, if you have access to more than one. Set up the data import to get your Custom Variable key (e.g. CV1) and Date as dimensions, and Revenue as a Metric. Change the format from Google's 20130113 to a Tableau DATE format. Since the date was stored in a custom variable, it was stored as a string. So that Tableau can treat this as a date, we need to convert the string to a date format. This was done by creating a new Calculated field in Tableau. We called the field "Cohort Date". The formula below worked for our purposes but would require some tweaking for larger datasets. Important: Tableau natively treated this as a "Measure" since it is a number. 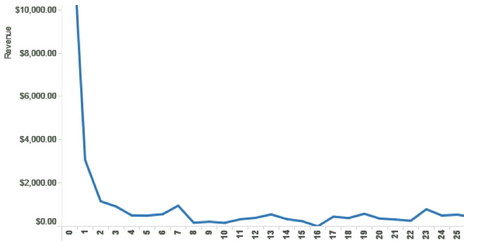 However since we're going to be graphing this on the X Axis, you should drag it to the Dimensions pane. Drag the Cohort date to the Filter pane, and select the cohort dates you'd like to visualize. For ease of use, I suggest, select only a few to begin with. Drag the Cohort to the color shelf to enable color coding of individual cohort dates. Now let's make a couple of adjustments to make the visualization more useful. In the color shelf, click the down arrow next to Cohort Date, and change the default display from Continuous to Discrete. Then, in the same field, select Exact Date instead of Year. There you have it. With a few steps, we’ve pulled data from Google Analytics via the API using Tableau, massaged the data and then created a very insightful visualization. With this work now done, the graphic can be easily updated/refreshed. This takes the manual and mundane work of setting up the graphic and automates it so we can spend more time analyzing the data and finding hidden insights for our clients. Posted by Shiraz Asif, Analytics Solutions Architect at E-Nor, Google Analytics Certified Partner. Learn more about E-Nor on their website, Google+ or check out their Marketing Optimization blog. The following is a guest post by Shiraz Asif, Analytics Solutions Architect at E-Nor, a Google Analytics Certified Partner. 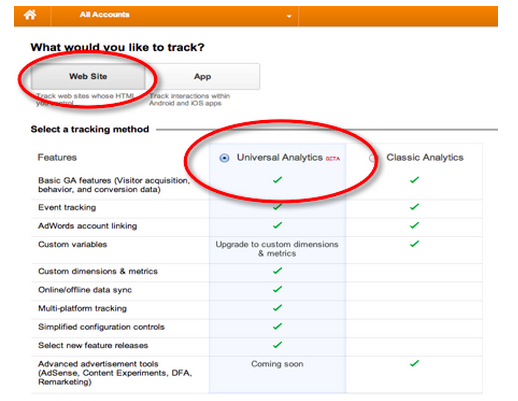 enhanced user-access control lists are coming to Google Analytics. Google Analytics users have long been requesting more fine-grained control over access to various parts of their accounts. We listened, and we're delivering that control over the coming weeks. Previously, user access was controlled with a role-based system. 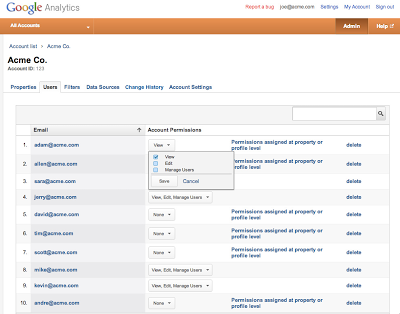 A user could be either a full account administrator, or a simple report viewer on your profiles. First, we’re expanding where permissions can be applied. We’ll allow permissions to be set not only at the Google Analytics account and profile levels, but also at the property level (learn more about these entities). Second, we’re enhancing the permissions any user can have. Instead of offering only two roles, (administrator & report viewer) we’re now allowing every user to have any combination of view, edit, and manage-users access. You can customize permissions for each user at the account, property, and profile level, providing a greater variety of access than was available with the previous role-based system. For example, one user can have full access to an entire account, another user can have edit and view access to a single property, and a third user could have view only access to a set of profiles. Properties inherit permissions set on their parent account, and profiles inherit permissions set on their parent properties. For example, a user with view access to an account, also has view access to all of that account's properties and profiles. The migration will convert account admins to users with full (manage users, edit, and view) access to that entire account; report-viewing users in the current role-based system will remain as users with view access to relevant profiles. By making these changes Google Analytics users will be able to better meet their access-control needs and have an even better analytics and reporting experience. Enjoy the new controls! 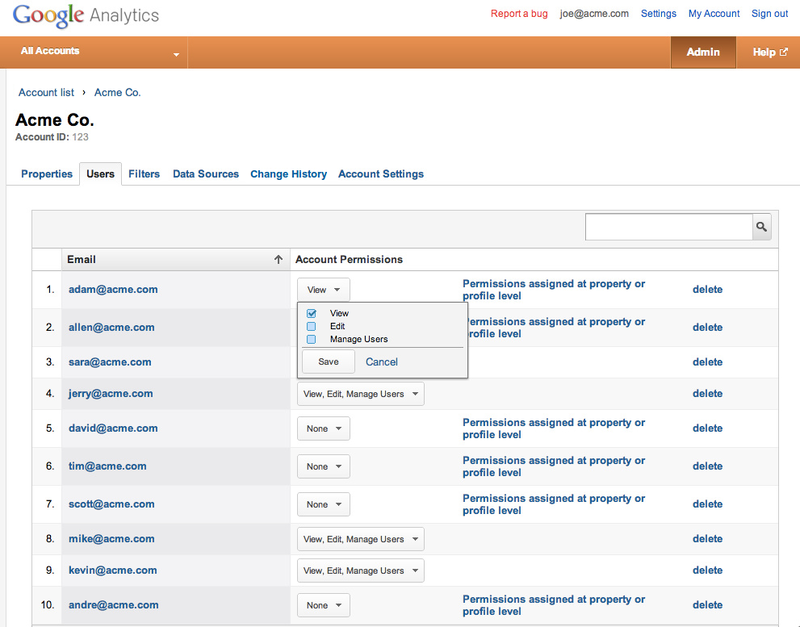 Today we’re excited to announce that enhanced user-access control lists are coming to Google Analytics. Google Analytics users have long been requesting more fine-grained control over access to various parts of their accounts. We listened, and we're delivering that control over the coming weeks. At DoubleClick Search we know that search marketing has expanded dramatically in scale and complexity over the years, and today, large search campaigns may be difficult to manage using manual methods alone. As such, marketers are relying more and more on automated bid optimization platforms to run larger campaigns -- enabling them to scale up and streamline their operations at the same time. Using the 7 factors as a guideline, you can choose the platform that’s best for your business, to help you save time, get the best results, and make better decisions in your digital marketing efforts. Stay tuned to the DoubleClick Search blog to learn more about enhancements, updates, and launches around the Performance Bidding Suite. To learn more about the 7 factors to consider when choosing a bid optimization tool, download our white paper here. A version of the following post originally appeared on from the DoubleClick Search blog.